This post may be relevant to an audience of one–myself–but I’m posting in case it’s helpful to anyone else. I’ve biked to the airport but I don’t go there frequently enough to consistently remember where the access point to the Guadalupe River trail is, so here are my notes. SJC’s website mentions bicycle and pedestrian access via trails but doesn’t include a map (the directions map shows bike parking but doesn’t call out the trail access point). Google Maps gives a usable route but you need to jump into Streetview to see where the actual access is–just after the trail goes under [road] you loop back to a crosswalk to a small parking lot and then another crosswalk to the terminal-side sidewalk that runs between Terminals A and B.
Here’s a photo mid-crossing (in the tiny parking lot) looking toward 87/Airport Parkway and showing the trail access point. 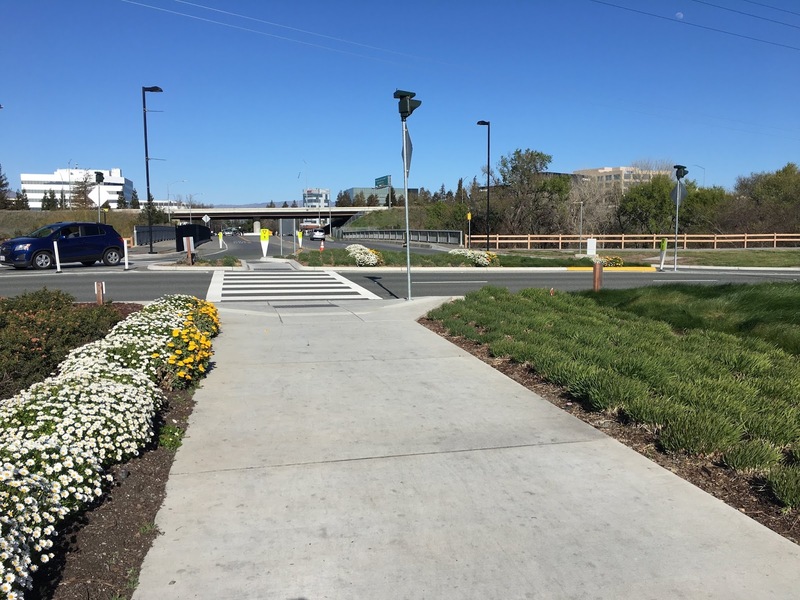 Guadalupe river trail access is across the crosswalk and to the left.